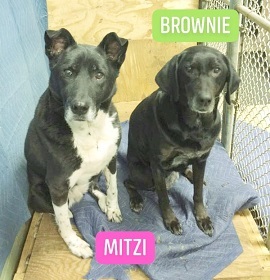 Meet MITZI & BROWNIE .. These sweet dogs have lived together for 8 years, & Last Hope would like to keep it that way. MITZI a Lab/Hound & her “sister” BROWNIE a Lab mix were in the same household since they were puppies adopted several months apart. They came to us from Babylon Shelter after their owner died last month. The girls are bonded with MITZI, the more timid one, often following BROWNIE’s lead. They enthusiastically greet new people they meet, and lived with cats. We are on the search for someone who could open their heart & home to BOTH dogs. This entry was posted in Adult, Dog Center, Dogs, Female, Special Needs, Wantagh Adoption Center. Bookmark the permalink.